At right is the painting by Fanny Aishaa entitled “Wisp of Hope. 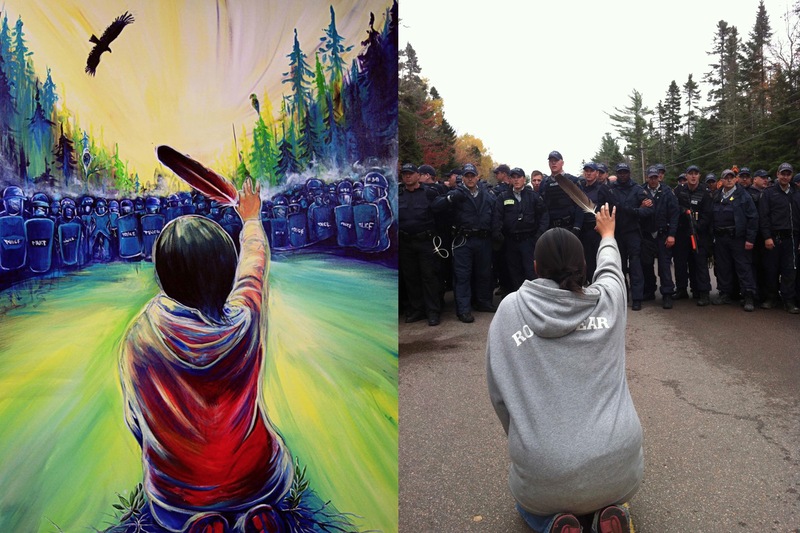 Aishaa based her painting on the Ossie Michelin, APTN National News, photograph of Amanda Polshies at left. Last week in Rexton, a small eastern Canadian town on the Elsipogtog First Nation Reserve, over one-hundred Royal Canadian Mounted Police (RCMP) wielding riot gear, side arms, tasers, tear gas, attack dogs, pepper spray, rubber bullets, nightsticks, and a variety of other weapons marched against a peaceful encampment of Mi’kmaq First Nation citizens and outside supporters. Among the chaos that ensued, RCMP Emergency Response Teams armed with assault weapons and dressed in military fatigues took aim upon the men, women, and children within the encampment along Route 134. Armed only with the power of song and eagle feathers, Native women formed a protective line against the ominous and threatening march of the armed police force. On this lone highway, First Nations women stood up against the combined assault of the RCMP and Southwestern Energy Company to defend their families, community, and ultimately their future. The RCMP had been requested by Southwestern Energy to service an injunction against protesters who formed a peaceful blockade around exploratory equipment to search for shale gas deposits. The Houston, Texas based company never consulted with the Mi’kmaq to gain their consent for exploratory testing or drilling on the Reserve. Yet, on Southwestern Energy’s public website they claim to be fulfilling the necessary steps toward drilling their first wells. As the RCMP marched against the blockade, much of the media that had arrived late on the scene and were required to remain behind police barricades for “their own safety.” This media barrier was conveniently positioned at a considerable distance away from any observable view of the RCMP’s assault on the encampment of Tribal leaders, lawyers, and other supporters. As reporters frantically huddled behind police lines, the only hint of danger emerged from the loud disapproval of protesters and a billowing cloud of dark smoke that soared above the tree lines. Women raise their drums on Mi’kmaq territory in Rexton, NB. Photo featured by Dallas MacQuarrie at NB Media Co-Op. Not long after the smoke had cleared, the only photo images and video that broke through police lines had been captured by protesters who carried smart phones and other digital devices. 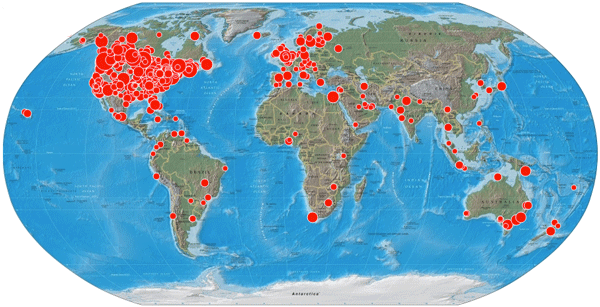 Social media sites exploded with activity as citizens on both sides of the border grew in support and outrage. Hundreds of images of from Elsipogtog First Nation Reserve infiltrated blog and social media sites. Every photo and video released had documented another part of the story about RCMP abuses. Social media had informed the world about the arrest of over 40 protesters. For example, on that day, a quick search on Google Trends for Canada revealed a 100 percent spike in search information for Rexton, NB. Making national headlines in Canada, the Rexton story failed to be picked up by mainstream American media channels. As a “modern” society, every Canadian and American should ask themselves how far have we really advanced on the issue of Indigenous rights? Why are colonial governments throughout the Western Hemisphere so threatened by Indigenous nations asserting their sovereign rights? As much as Americans point the finger at Canada we also have three more fingers pointing back at ourselves. After the assault by RCMP officers last week, it stands to reason that Indigenous sovereignty is a threat to large corporate interests. This ominous financial threat as perceived by corporations, like Southwestern Energy, has lent pro-business politicians the ammunition to attack Indigenous sovereignty and rights. While entire libraries, congressional inquiries, and special investigations should be devoted to these larger questions, the main purpose of this article is to uncover the historic roots and philosophies that influenced the modern Idle No More Movement. The history of the Idle No More Movement began in the early 1960s at the juncture of Native Nationalism and Red Power politics. Indigenous peoples on both sides of the border started to embrace a new brand of Intertribalism and coalition politics. This was a progressive populism that strove to unite both First Nations and American Indian peoples into an Intertribal coalition. Such a coalition held both the real and imagined potential to actively support grassroots Native Nationalist causes (fishing rights, land rights, mineral and water rights—just to name a few). Several major organizations (Metis Society, Federation of Saskatchewan Indians, National Indian Brotherhood, Native Alliance for Red Power, National Congress of the American Indian, National Indian Youth Council, and United Native Americans are only some examples) championed Native rights well before the intellectual foundations of the Red Power movement appeared in literature. Two of the most influential manifestos made their way onto bookshelves toward the end of the 1960s, First Nations Cree author Harold Cardinal’s Unjust Society and Dakota scholar, Vine Deloria’s famed Custer Died for Your Sins equally supplied clarity and definition to this international Native rights movement, widely known as Red Power. Cardinal’s work lent scholastic and popular support towards overturning Prime Minister Trudeau’s White Paper a policy that strove to limit and eradicate First Nation sovereignty. Similarly, Deloria’s famed book provided an ideological anchor for a repeal of termination legislation and supported self-determination (from 1953-1970s over 109 Native Nations had their federal trust status terminated through individual acts of congress). Throughout the 1960-1970s, various Red Power movements clashed with corporations, police, and military forces on both sides of the border, from the Fish-ins in the American Northwest, to the Indians of All Tribes takeover of Alcatraz (1969), to the Kanora Protest (1965), and the 1967 Expo to Wounded Knee (1973) and the march on Ottawa in 1974. Thousands of Indigenous peoples crossed the U.S.-Canadian border in solidarity and support of Red Power. The end results are complicated, but overall the Red Power movement aided in the defeat of the Trudeau’s White Paper and repeal of termination legislation. These coalition politics gathered lawyers, activists, writers, artists, and scholars together that jumpstarted the era of self-determination. Red Power struggled for legislative and governmental reform, land and treaty rights, but one of the movements most imposing of obstacles dealt with the continued corporate and industrial abuse of Native lands and peoples. The Bureau of Indian Affairs provides what it calls a “one-stop service” to industries seeking new locations and to Indian tribes seeking industrial development through private investment…In return…what do Indians offer Industry? Manpower, space and a choice of sites, and the opportunity to become part of the growth plans of areas newly emerging from rural isolation. As the keywords in the Nation’s Business article testified, Native Lands were isolated and contained an exploitable source of cheap labor—all backed by the federal government. Of course, it would have been great if Ford or Chevy had attempted to open an auto factory on any reservation, but this was never the type of industrial development supported by the federal government. Ultimately, the military industrial complex focused on exploiting mineral rich Native lands. To date this one-stop chop shop has never worked out well for Indian Country. A future corporate history of Native North America might reveal that TransCanada, Platinex, Suncor, Syncrude, Hydro-Quebec, Eagle-Picher Corporation, Anaconda, Kerr McGee, St. Regis Paper Company, Hearst, Kimberly Clark, PG&E Corporation, AMAX, Alcoa or Reynolds, General Electric, Monsanto, Barrick Gold, and Peabody Coal, just to name a few, evaded environmental restrictions and responsibilities; exploited mineral and natural resources; and aided in promoting the toxic destruction of Indigenous lands and peoples. For example, in the US over 600 hazardous waste sites exist in Indian Country, which is at least one hazardous site for every federally recognized Tribe. Perhaps, a modern divestment movement might aide in the current fight against corporate abuses occurring all across Turtle Island. American Indian history often reads like the miner’s canary, an eerie harbinger of our global future—it is only a matter before the effects of overzealous natural resource extraction begins to affect every American and Canadian. It is this historical base, rooted in Red Power, which informs the political foundations of the Idle No More movement. In other words, the Idle No More Movement didn’t just spring up overnight (some have tried falsely to liken it to the former occupy movements). 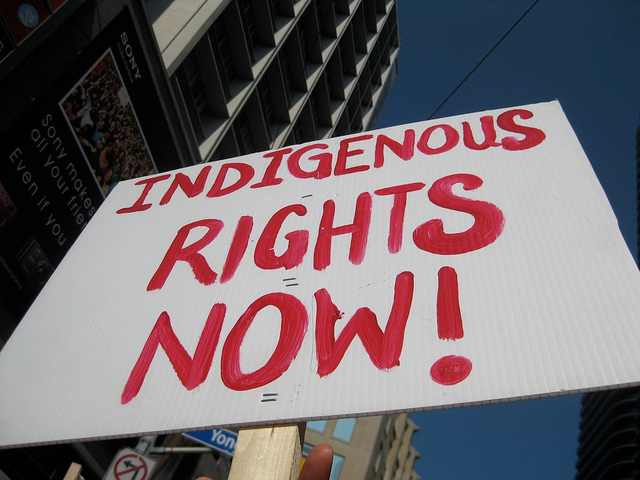 Rather, Idle No More has a very complex and diverse modern history that originates in Canada. 1989, the 78 day occupation at Oka, located on the Kanesatake Mohawk Reserve squared off Canadian military against the local community eager to protect their sacred lands from a proposed golf course expansion. 1990, Lil’wat blockade against logging roads on the Reserve led to the arrest of 67 First Nations peoples. The Lil’wat blockade also led to the ongoing protest over the proposed development of Cayoosh Ski Resort in British Columbia. On September 6, 1995, Anishinaabeg citizens at Stoney Point Reserve were attacked by Ontario Provincial Police (OPP) for the return of Ipperwash Provincial Park which had been loaned to Canada temporarily for the war effort in World War II. In the police raid on the peaceful encampment, Dudley George, a Stoney Point citizen, was gunned down by the OPP. 1995, at the Gustafsen Lake standoff, over 400 Royal Canadian Mounted Police marched against the Shuswap First Nation peoples and Ts’Peten Defenders in British Columbia. The month long standoff had resulted from non-Native ranchers that threatened the religious freedom and Shuswap Sun Dance. 1999, Mi’kmaq on the Burnt Church Reserve of New Brunswick where engaged in a fishing rights struggle and outright naval war that led to two groundbreaking Canadian Supreme Court Decisions. Known as the Marshall Decisions, these Supreme Court decisions defended both treaty and fishing rights. 2003-06, Six Nations Reserve, Mohawks fought against OPP to protect treaty lands at Caledonia from a suburban development sponsored by Henco Corporation. Each of these peaceful movements ultimately led to violent clashes over human, treaty, land, and harvesting rights with Canadian police. From this long and at time violent history emerged the Idle No More Movement. A non-violent movement that begins with the TransCanada (founded in 1951) pipeline or Keystone XL [see Keystone Map for location]. The pipeline has been in operation since 2010, which acts to convert some former natural gas lines into pumping crude oil from Saskatchewan and Manitoba. The pipeline stretches across the Medicine Line for over 1,000 miles running through the states of North Dakota, South Dakota, Nebraska, Kansas, Missouri, and Illinois. The second phase of the Keystone pipeline includes an extension line that runs from Steele City, Nebraska to Cushing, Oklahoma. Over 11 new pump stations are primed to deliver close to 600,000 barrels of crude oil every day. Two more phases of the Keystone pipeline are in the works that will add another estimated 500,000 barrels of crude oil to the lines. Projections estimate that these lines will potentially net over 1 million barrels of black gold per day (the US alone consumes approximately 20 million barrels of oil a day). 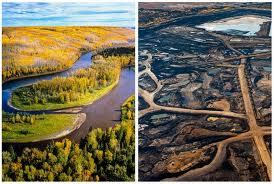 Before and after tar sands extraction. Photo featured at EcoEarth.Info. As of May of 2013, the Northern Gateway Line proposed by Enbridge has been blocked by provincial officials in British Columbia. This legislative action by in British Columbia effectively cutoff access to pacific oil markets and accelerated a renewed corporate campaign to approve the expansion of the Keystone XL pipeline in the United States. In March of last year, over 75 Lakota, including a 92 year-old grandmother, prevented Keystone pipeline service trucks from entering Pine Ridge Reservation. At a recent Idle No More rally in Toronto, First Nations people joined with Labor Unions to lobby enough support to block the proposed Enbridge line 9 that is slated to run east from Sarnia to Montreal in a thirty-seven-year-old pipeline structure. On the “closed” Red Lake Anishinaabeg Reservation (closed meaning: one of the few Native Nations that avoided allotment) in Northern Minnesota, Red Lake Tribal citizens have launched a concerted campaign to prevent Enbridge from extending its pipeline through Red Lake lands. Ample evidence and examples abound that highlight the vulnerability and numerous leaks that have increased in frequency over the last few years (Mayflower Oil spill in Arkansas). Some of the blame lies squarely on the number of pump stations, when the number of pump stations are increased on any line it automatically raises the pressure/flow within the pipeline itself and this action can jeopardize the overall integrity of the pipe. Pipelines are not guaranteed by some supernatural force from ever rupturing, it is not a question of if but only a matter of when—despite constant satellite inspection at central command centers a spill or break is inevitable. Two months ago, Greenpeace Canada estimated that over 1.5 million barrels of tar sands have leaked and are continuing to leak at four different sites in Alberta. If leaks are inevitable, then the proposed Keystone XL pipeline that is slated to run dangerously close to the great Ogallala aquifer is a national threat. Any spill could endanger this precious fresh water resource that is being recharged less and less every year despite chronic dependence on the aquifer by area farmers. A recent Kansas City Star article cited a Kansas State University study that calculated that the Ogallala aquifer has just enough water to last until 2110 (a single lifespan). A major pipeline spill would considerably reduce this estimate. Considering that the Great Plains are still America’s bread basket, we could also face a major food shortage without access to adequate fresh water supplies. Is it possible that America’s access to fresh water resources are growing scarcer than natural gas or oil, which deserves our protection? Our national security is not only threatened by our dependence on foreign oil but this threat is multiplied tenfold if we lack access to fresh water. More importantly, this issue moves beyond a conservative or liberal agenda…at stake is the trust of preserving a better world for future generations. Presently, the Canadian branch of the Keystone pipeline has been constructed not less than fifty miles from over 150 First Nation communities and twelve reserves. In the United States over one-hundred miles of pipeline are located on Native lands. In September of 2011, Indigenous leaders from both Canada and the United States were arrested outside of the White House for protesting against the expansion of the Keystone Pipeline. In a mass public relations campaign in Canada, TransCanada has made sizeable financial contributions to the University of Toronto to support Aboriginal studies. Despite mass arrests and corporate buy-ins to major universities both First Nations and American Indian communities are struggling to ward off the negative effects imposed by large multinational corporate interests promoting tar sands oil production and hydraulic fracking. 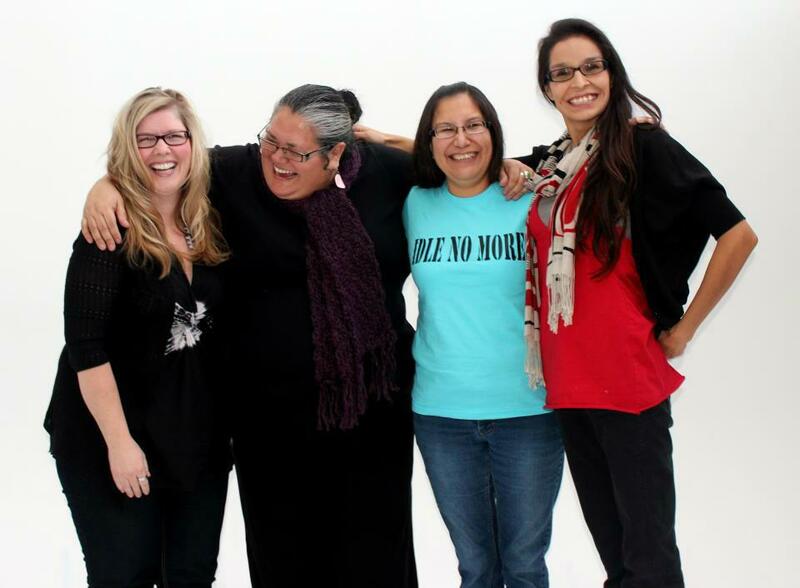 To combat against the rise of a corporate police in Canada, First Nations and non Indigenous leaders Nina Wilson, Sheelah Mclean, Sylvia McAdam, and Jessica Gordon sponsored a new political platform and coalition to peacefully unite both Indigenous nations and supporters around a central environmental justice campaign (see Idle No More website). Together these four leaders sought to actively block the conservative administration of Prime Minister Stephen Harper, who without parliamentary debate passed anti-Indigenous legislation that favored multinational corporate interests. For instance, Harper’s administration sponsored Bill C-45 that changed over 44 laws that once protected fish habitat and now threatens First Nation fisheries; it removed the environmental assessment requirement in the Navigation Protection Act which has left only 1% of Canada’s waterways protected. Secondly, Bill C-38 ignored more than 70 laws to protect game, fish, and water. Finally Bill C-27, required for the first time, that First Nation owned businesses publicly report all their earnings and expenses—an act which undercuts the economic competitiveness and integrity of First Nation businesses. 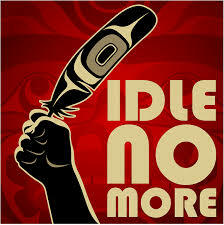 Idle No More by artist Andy Everson. Canadian Prime Minister Stephen Harper’s “reforms” called for the outright surrender of thousands of acres of First Nation Reserve lands for selective development by oil and gas industries. These lands were specifically targeted by TransCanada and other corporations for the exclusive right to expand oil, nuclear, and gas industries. Already witnessing the permanent effects of environmental degradation on their First Nation lands from the tar sands industry, the four women Idle No More leaders organized a National Day of Solidarity and Resurgence. On December 21, 2012, hundreds gathered in major cities and Indigenous communities throughout the world to call for an end to Harper’s destructive anti-First Nations policies and legislation. One month later, on January 28, 2013 First Nations peoples and supporters marched on thirty Canadian cities to protest against the illegal seizure and ruin of First Nations lands. Elders like Attawapiskat First Nation Chief Theresa Spence and Pimicikamak Cree elder Raymond Robinson, who had each witnessed the tar sand apocalypse occurring in First Nations communities in Alberta, issued an immediate call for a meeting with Prime Minister Stephen Harper. Their pleas were ignored and went unheard by Harper’s administration. In opposition, Spence and Robinson sponsored a hunger strike to draw Harper to the table. While the hunger strikes failed to produce fruitful negotiations, it did draw international support and criticism of Harper’s policies. Map by Mark Blevis (markblevis.com) generated using Sysomos Heartbeat. The raid on the peaceful anti-fracking demonstration on Mi’kmaq lands is causing international notice to what appears to be a corporate police state in Canada. Proof is in the hundreds of photos that streamed across the internet. Photos that revealed First Nations women willingly placing their unarmed bodies before the marching armies of the RCMP—it looks like the same old cavalry. Replacing gold with oil, bluecoats with camouflage, rifles with pepper spray, forests with wastelands, and streams with flammable water—all in the name of progress. Apparently, we are all witnessing a renewal Manifest Destiny and frontier politics. Idle No More remains a non-violent movement that seeks to expose the corporate and governmental exploitation of Indigenous rights and lands. This movement has also supported recent amendments to the 1994 Violence Against Women Act to include American Indian women, violations of the Indian Child Welfare Act, to seek justice for the thousands of missing and murdered First Nations women, and issue a review of deaths and abuses that took place within Canadian Residential Schools. As a modern Indigenous movement, its leadership extends far beyond the four original founders, for this is a coalition of Indigenous peoples and outside supporters who collectively advocate for the protection of Western and Native lands from a threat of environmental degradation. Beyond borders, western historians, scholars, students, and residents alike should take stock in this movement—this is not just a Native issue, this is a universal issue. I overheard someone recently mention that we can live without oil but we certainly can’t live without water—the moral, political, and legal choice, is actually very simple. As a historian, I have found one of the best ways to participate in the movement is through education and writing. Last year we sponsored a teach-in on the Idle No More Movement at the University of Minnesota, Morris. Teach-ins are wonderful events that bring scholars, students, and the community together to tackle our most pressing challenges as a collective society. If teach-ins or holding up a banner is outside of your comfort zone, then lend your voice, write a letter to your political representatives, sign a petition, share a story on a social media site, or better yet write an article and lend your research skills and voice to the cause. Excellent a must read for all! I am from vancouver and i have been to a lot of Idle no More rallies here.Idle No More will be important for the MiKmaq Natives of New Brunswick in their fight against fracking on their land.The gov. of New Brunswick should do what the gov. of Newfoundland just did and not allow any fracking in the province. People in different parts of the world fighting for their independence have their own orgs.to fight against their govs.Like for instance the people in Puerto Rico fighting for its independence from the USA.In Northern Ireland the Irish Republicans have their own orgs.for fighting against British Imperialism and to unite Northern Ireland with the Republic of Ireland.In Palestine the Popular Front for the Liberation of Palestine(PFLP)is doing a good job in getting international support for its struggle against the apartheid israeli gov.Long Live,Idle No More and keep up the good work. Fantastic article! You provide much needed analysis regarding the long history of attacks on First Nation and Indigenous rights because of corporations drive towards resource extraction, violating everyone’s right to live on this planet with clear air, water and land. You do a great job situating the long history of struggle, which is so important, against new forms of Manifest Destiny over the last 50 years. What is the best way to contact you about republishing this piece with your permission and credit? Can you email me directly? Just publish it. I got nothing to hide.Contact as many people as you can. Keep up the good work. It is indeed. Thank you for the correction. Still want to contribute something to ICT Op/Ed page? Just read this for a Modern Native American History class down in Baltimore! Great read, keep it up! Desde tiempos inmemoriales los originarios hemos sido muy amables con muchos extranjeros, y en retribución hemos recibido su ambición descontrolada. Great piece–respectful, accurate, celebratory. One small edit: the name of the First Nations woman holding the eagle feather in prayer as she confronts the RCMP at Elsipogtog First Nation Reserve is spelled Amanda Polchies, not Polshies. The colonial occupation of Turtle Island is beginning to unravel, though not without severe tests for the courageous indigenous peoples trying to protect what’s left of the biosphere across the continent.